Crispy crunchy salmon patties, or salmon cakes, are made with just three ingredients plus a little oil for the pan. Everyone loves them! My recipe for tuna cakes is famous. No, really! So I thought I’d give it a whirl with salmon instead. Why? Well, we all know we’re supposed to eat more fish, of course; but my difficulty is that I’m not a huge fan of fish. I have to come up with creative ways to sneak the swimmy little beasts into my diet. That’s why I’m so fond of tuna cakes, salmon patties, and the like. Or tuna patties and salmon cakes, if you will. It’s all the same type of thing. 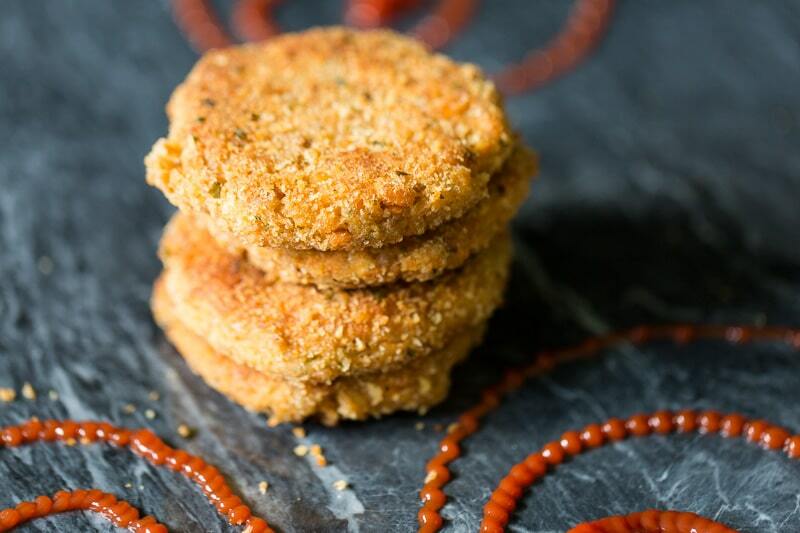 The nice thing about these salmon patties is that they are a hit with everyone. I eat them. Kids eat them. Your mother-in-law will eat them. Since they only have four ingredients, you just whip them up in a bowl in minutes and toss them in the saute pan with a little oil. I’m a fan of dipping them in ketchup, as my children have carefully indoctrinated me to do. (Have I mentioned that I’ve also started cutting the crusts off my own sandwiches?) You are certainly welcome to gussy it up any way you like. Perhaps bearnaise sauce or a horseradish cream? 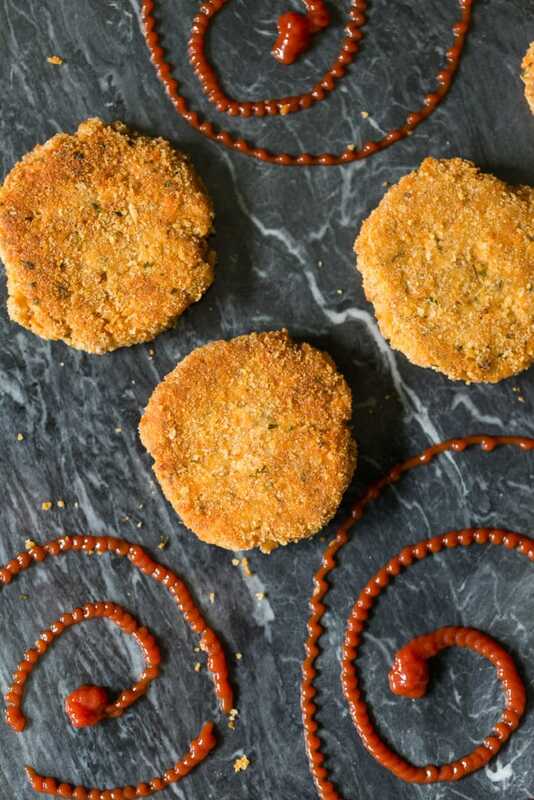 If you’re not convinced yet, here are some reasons to make these salmon cakes. It contains omega-3 fatty acids, which are essential fatty acids that the body cannot produce by itself. Eating salmon reduces the risk of heart disease and other chronic diseases. Research has shown that the nutrients in salmon help maintain brain function, joints, and eyesight. Don’t take my word for it. Read my sources at BBC Good Food and Men’s Health. Plus, it may give you the supernatural ability to leap into the air using only your fins. Preheat the skillet with the oil in it. Don’t pour cold oil into a hot skillet. If you don’t have Italian breadcrumbs, you can use plain breadcrumbs—but you’ll need to add some salt and seasonings for flavor. Wild caught salmon tastes better than farmed. Buy it in cans for easy storage and preparation. Make sure the label says boneless skinless salmon! If it doesn’t, there will be skin and lots of bones in it. You can also used leftover cooked salmon to make these patties. Flake the salmon into pieces and follow the recipe from there. Dip these salmon patties in classic remoulade sauce. So good! 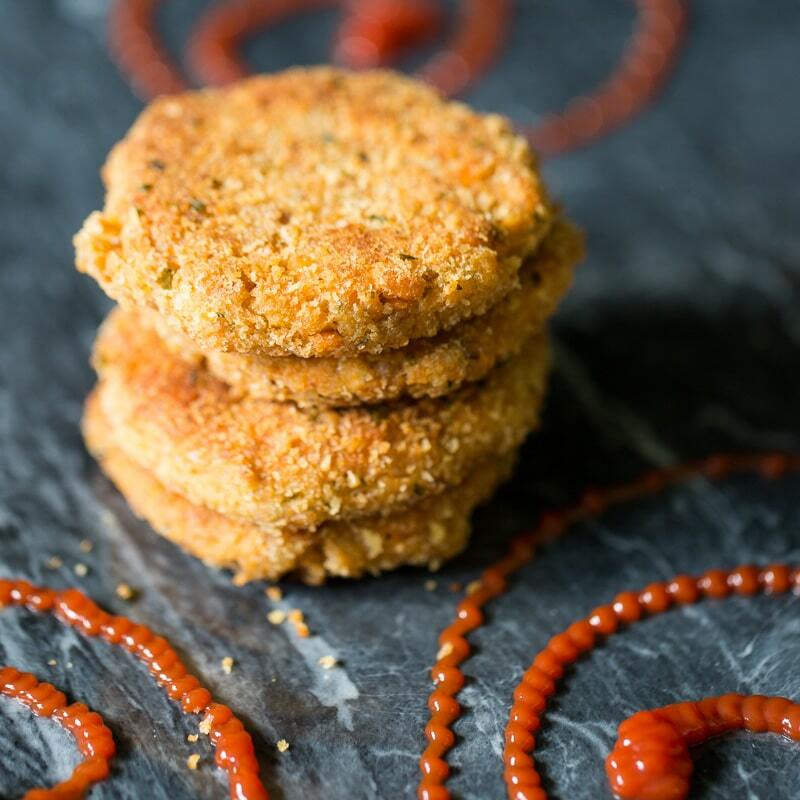 And don’t miss my crispy tuna cakes, too! You might also enjoy these tuna burgers. Add enough oil to cover the bottom of a large nonstick skillet to a depth of 1/4 inch. Preheat the pan with the oil on medium heat while you prepare the salmon. Combine the salmon, the eggs, and 1/2 cup of Italian breadcrumbs. Stir thoroughly until the mixture is well combined. Pour the 1/2 cup of remaining breadcrumbs on a plate. Form the mixture into round patties about the size of the center of your palm. 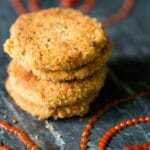 Place the formed patty on the breadcrumbs on the plate; pat gently to make the breadcrumbs stick, then flip and pat the other side into the breadcrumbs. Slip each patty gently into the pan. Fry on one side for 2 to 3 minutes, until the cooked side is golden brown. Flip the patty and fry the other side the same way. When both sides are golden brown, remove to a plate lined with paper towels to absorb excess oil. Serve warm. Also try my easy salmon tacos recipe! I grew up eating salmon patties and I’ve always thought they were delicious. Salmon is my favorite fish and you’re right, wild salmon is so much better than farmed. These days, my husband grills our salmon fillets, but I need to make your salmon patties. Love um! I always get super nervous about fish, but these look super delicious as well as easy! I used to not like Salmon until recently. So yes, I am excited to try your recipe. I’m sure it will be a huge hit at home. I’m thinking that this should be good with my favorite garlic & cheese dressing. We catch and can our own fresh salmon in alaska. Salmon patties is a favorite meal, I add onion and green peppers. That looks so good. My family loves salmon patties. I make them at least a couple of times a month. I can’t wait to try this recipe. Oh my goodness is this look good! This might be perfect for Super Bowl Sunday! I’m definitely going to give these a try. I really need to make this again. I’m not sure I’ve made them since my grandma died. She always made them for us. Oooh, we love salmon. 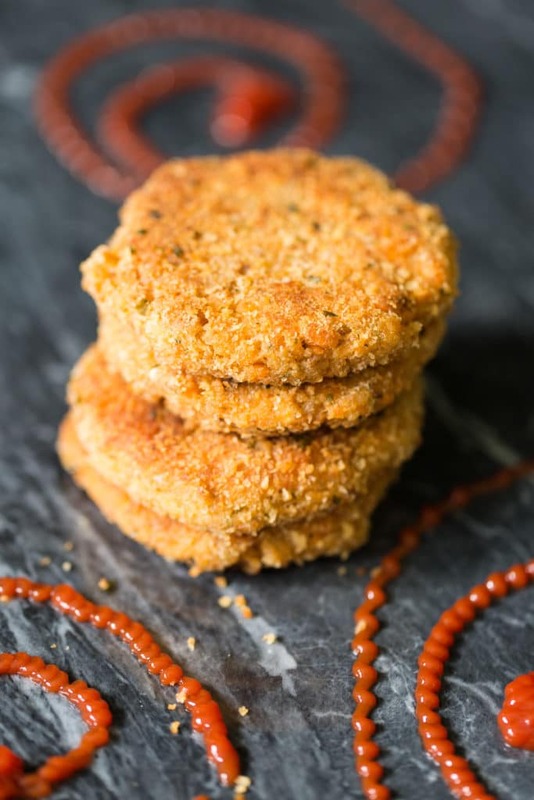 I love the idea of making these breaded patties. They look and sound so delicious. Can’t wait to try this recipe. Yum!! These sounds super delicious and easy to make! I haven’t made salmon patties in years! I’ll have to try this recipe now that I’m thinking of salmon lol. Salmon is my favorite fish to eat. I will have to get the ingredients I need to make this for dinner this week. I am sure it will be a hit with the kids. My kids and I absolutely love salmon but we have never had a salmon patty. Would love to try these to make weeknight dinners a bit easier on me! This brings back so many memories visiting my grandma l. She loved salmon and she would make me salmon patties too. We are big salmon eaters in my home. We have it about once a week, because we eat it so often I try to change it up a bit. I’ve not tried it with a crunch, I will give it a go for next week. What a great idea! I’ve never been a big seafood eater, but I do love the idea of the fried/baked patties! I do the same with eggplant – it’s easy to make and I bet these would be great over pasta! Salmon patties were one of my childhood favorites. I will have to try this to see if it’s like I remember!